Some hymns take work to get into our hearts and mind and voices. Others roll right off the tongue and stick. Hymn #116 is one of those “sticky” hymns. It’s so easy on the ears, on the voice, in the mouth, and on the memory. What gives it these characteristics? Let’s take a look. The opening tune is simple and easy to sing. But the F to E resolution as well as the stepping down after the double leap up to C give it a memorable and singable shape. Notice how the tenor line is in parallel 6ths with the soprano for the first 4 notes. And then notice how the stepping down of the soprano line on “Savior” is mirrored, but in reverse, in the tenor. This little bit of tension brought on by contrary stepping motion between soprano and tenor give thy hymn a beautiful, extra emotional color. The memorable elements continue in the next 4 bars. Bars 4 and 5 are the first of a repeated sequence. Both the soprano part and the bass are portray a perfect sequence. After 2 bars, it repeats itself a step down. And the little 4 note tune is quite lyrical; a step up, a leap down, and resolving with another step up. So far, we have a very memorable hymn tune. “For thus alone” shifts suddenly into the parallel minor. Meaning, we were in C major, and now we’ve slipped into C minor. The minor mode colors the text describing how this alone, following Jesus, is the way we can be one with Him. It adds a special emphasis to the key point of the text. After passing through a g minor chord and a D major chord on “we be,” we resolve back to the major mode on “one” with a G major chord. And did you notice the melody on “we be one”? The D-E on “we” harkens back to the sequence in bars 4-8. It’s the first 2 notes of the sequence. But this time it leaps way up to B to prepare for the climax 2 bars later on high C.
“With God’s own” mirrors bar 3 with another reverse motion of the same notes in soprano and tenor. The soprano sings B-A-G while the tenor ascends through G-A-B. All of that on top of an F makes for a strong harmonic gravity. This is a G chord, a 5 chord, but with the 7th in the bass, the F. That F desperately wants to resolve to the E in the next bar. And with the reverse mirror effect occurring over its desperate need to resolve, we get all kinds of strong harmonic juices leading to the climax of the high C. Very strong writing. And notice one more thing. The last 3 chords mirror the opening 4 chords of the hymn with 6ths between the soprano and tenor. This may seem subtle and arbitrary, but it brings back the same warmness we felt in the opening bars. With the added gravity of the F# diminished chord on the “be-” of “begotten,” we are ready to end on a nice authentic cadence, 5 chord to 1 chord. It’s a shame verses 5 and 6 are not included in between the staves. They are beautiful verses. But I don’t think I’ve ever heard them sung in Sacrament meeting. I hope the committee will re-think this strategy this time around. 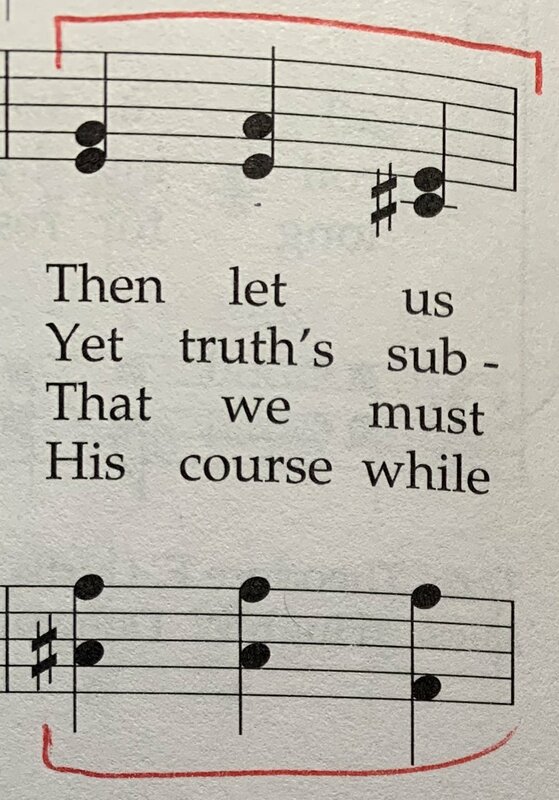 This hymn once again shows the folly of putting verses outside the music. Karen Davidson eloquently explains that “this hymn cries out for all six verses to be sung. Verse six satisfies our wish for poetic completeness, since the three final words also begin the hymn and are the hymn’s principal message: ‘Come, follow me.’ Even more important, the fourth verse begins a new point: that we must continue our discipleship of Jesus even in the next life. This point is rather inconclusive without the additional details of verses five and six, which state that ‘glory great and bliss are ours’–and, by implication, nothing less than godhood’–if we are among the most faithful. This bold and compelling promise is unique to Latter-day Saint theology, and it is beautifully expressed in this Christ-centered hymn.” Yes! Let us sing the complete message of the hymn, and not short-change it! The suggested tempo marking I think is woefully too slow. I can’t think of an appropriate instance where this hymn should be sung anywhere in the vicinity of 69-76. I find that I play it around 100-104, which I think moves the hymn along nicely. It is not a dirge piece, after all. Please, as a discipline, go and play this at 102, and then play it at 69. I think the immediate difference will tell the story. I would use the same calm registration as has been previously suggested as well.